Recently, when a TV program I was watching took a commercial break, I decided to open up Spotify on my phone. The app informed me that a band I like was coming to my town soon. Did I want to buy tickets for the show? It was like the app read my mind. I’d been looking for a fun date activity, and this concert fit the bill. While I was in the process of checking out, I noticed that the TV was blaring an ad for cat-food. I’ve never owned a cat, and I reside firmly and unshakably on Team Dog, so the TV ad was irrelevant to me. The juxtaposition between the two marketing universes I was simultaneously inhabiting could not have been more stark. The reason that the marketing I was getting from Spotify was so much better than that from my TV has to do with the field of behavioral marketing. Let’s take a look at what behavioral marketing is, how it can help your company earn more revenue, and why it builds user trust. Behavioral Marketing is hyper-targeted marketing tailored to the unique preferences of each person you are trying to reach. These preferences are determined by tracking their behavior and then determining what messaging will be the most meaningful at a given time. Because my music app knew what songs I listen to, what genres I like, what artists I follow, and where I live, it was able to serve me just the right ad at just the right time. It wasn’t a coincidence — it was incredibly data-driven. While your website may not have that granular level of detail on every user, you still have a lot of data at your disposal. Each user who comes to your site took a particular journey to get there, and leveraging what you know about their past behavior can help you reach them with relevant messaging. Furthermore, you can track exactly what a user is doing once they reach your site and send them targeted, high-value messages based on their browsing tendencies and where they are on the buying journey. Behavioral marketing is a way of synthesizing what you know about a visitor’s past and real-time behavior and then using prompts, messages, and other tools to provide a great user experience. If you reach your user at just the right time, magic can happen. You can analyze the past purchases of your customers and use that information to send them tailored recommendations, product discounts, calls to action, and other marketing messages. If a visitor purchases one type of item with regularity, send them information on that item. What parts of your website are people clicking on? You can use this information to determine the best timing for things such as push notifications, exit-intent popups, and other on-site reminders. Has this visitor been to your site before? What did they do last time they were there? Tracking this basic user info pays huge dividends. In a world that increasingly uses ad blocking tools, reaching users in their inbox is all the more powerful. By monitoring the behaviors that result in email list sign-ups, you can effectively target your users with customized email marketing campaigns. How can you encourage users to engage in specific behaviors, or help them out if they are stuck? This could include actions such as offering timely, live customer support if you have determined that a customer is having trouble making a decision. If you know where your users are, you can serve them messaging that is highly relevant. A perfect behavioral marketing example is how Spotify told me one of my favorite bands was coming to town. A user who searches your site for “shoes” probably won’t appreciate a pop-up advertising your latest t-shirts. You can use search data to make sure your interactions with each user are highly relevant. Visitors will come to your site from mobile phones, desktop computers, and tablets. The users of different devices tend to exhibit different user behaviors. For example, you might be able to show a desktop user a text-heavy ad, since they have the space to take it all in. Being able to target by device can be critical in crafting the most relevant messaging. Now that we’ve covered the basics, let’s dive into how you can best utilize behavioral marketing to take your business to the next level! Each person who uses your site will view different pages, click different links, conduct different searches, and buy different products. These behaviors tell you a lot, and they can be used to trigger customized emails to your visitors. These customized emails, which commonly encourage a customer to complete an action or to buy a similar product, comprise an email retargeting strategy. Email retargeting should not be overlooked, as it can help you to convert a lot of potential customers. Retargeting emails have an open rate of 60%, which is a huge improvement over the overall email average of 20%. A common example of email retargeting is found in the world of e-commerce, where cart “cart abandonment” is a big issue. Three out of four customers abandon their shopping cart before checking out, and businesses are constantly looking for ways to get these people to come back to a site to complete their purchases. Email retargeting can be effective in doing so. It’s a clever email in that it not only encourages you to log back in, but it offers a nice 20% discount on your purchase. If someone visits your site and leaves without buying anything, you should have plentiful information with which to craft them a retargeting email that incentivizes them to come back and become a converting customer. As you track user behavior, you create unique customer profiles. These profiles help you determine how to target your marketing, and it can be based on browsing history, purchase history, interests, location, what items they have put in a cart, and more. A great way to use this information to increase conversions is by showing custom product recommendations. It seems like no one does custom product recommendations quite like Amazon, and this is especially true of the Amazon-owned website GoodReads. Every time I log in to the site, I’m encouraged to check out books I might like based on what I’ve already read. Goodreads compiles these lists based on books I’ve purchased, books I’ve written reviews for, books my friends have read, and several other factors. It’s startlingly good at knowing what I like, and it has increased my overall engagement with the site. Good product recommendations are a major boon to the user experience. With the information you get from tracking, doing some level of custom product recommendations is a no-brainer. You might not get 35% of your revenue from product recommendations, as Amazon does, but you will certainly increase your chances of turning the average user into a paying customer. Social proof is the psychological and social phenomenon that our own behavior is impacted by the influence of the actions, attitudes, and beliefs of other people (online or in-person). The numbers bear this out. Consumers are 71% more likely to purchase based on social media referrals. We all intuitively understand this concept. I don’t want to be the first person to try a new restaurant, for example. But if I check with my friends, and they all tell me that the food is unbelievable and the service is top notch, I will happily become a patron. Similarly, if I walk by the restaurant on opening night and it’s packed with people,I am more inclined to try it. These same principles can now be used online in increasingly effective ways. When social proof is leveraged using a plugin like Proof, it can help lift a brand’s conversion rate by 10-15 percent. 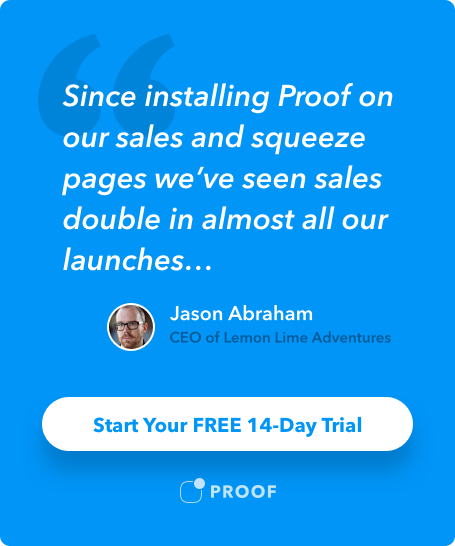 Proof allows brands to showcase real-time customer activity notifications, feature compelling customer testimonials, display badges, and more. Social Proof notifications are a unique tool for behavioral marketers because they are able to display the recent behavior of other customers. For instance, you can show a stream of recent individual conversions, aggregate conversions, or even a live visitor count of a certain page. Our “Hot Streak” feature is like the digital version of showing a long line outside a popular nightclub, and it increased our conversion rates by 53%. In a world where influencer marketing is king, you want to maximize your ability to show your users that their friends, and other people they respect, are happily engaging with your products. In the pre-behavioral marketing dark ages, email campaigns were simplistic, boring, and repetitive. Companies would blast out a message with an update or a product pitch without bothering to tweak the message or the delivery style based on the target recipient. With modern tools, that should not be happening. Now, there are almost endless ways you can adjust a customer’s email flow. You can customize based on location, behavior, a resource they downloaded, or any other touchpoint you are tracking. Basically, user tracking gives us the ability to craft emails that are curated in a way that makes the recipient feel like the sender actually gets them. You can also run multiple email campaigns targeted towards users who have shown certain tendencies, clicked on certain parts of the site, or signed up at certain times. Each of your users can (and should) be segmented into different categories so that they receive only the most relevant emails with customized calls to action. Segmented emails generate 58% of all email revenue, so this is an area well worth optimizing. A company that excels in this regard is the marketing and sales platform HubSpot. They have accrued a seriously impressive amount of customer testimonials, in large part due to their mastery of personalized email marketing. They also offer a great free guide all about email marketing, which includes tips on how to deal with small hiccups you might not think about at first, such as avoiding spam filters. Personalized emails and well-crafted drip campaigns can be instrumental in building your business. Seeing as email marketing is 40 times more effective than Facebook and Twitter advertising combined, you should see a high ROI by utilizing the best techniques. Custom product recommendations, social proof, and a smart email strategy can help your brand cut through the noise. By tracking your users’ behavior, you gain the ability to market in a way that is a total win-win: your users aren’t annoyed, and you get more conversions.